Steep socioeconomic (SE) hierarchy in the post-industrial Western society threatens public health because of the physiological consequences of material and psychosocial insecurities and deprivations. Following on from their previous books, the authors continue their exploration of the geography of early mortality from age-related chronic conditions, of risk behaviors and their health outcomes, and of infant and child mortality, all due to rigid hierarchy. They divide the 50 states into those that gave their electoral college votes to Trump and those that gave theirs to Clinton in the 2016 presidential election and compare the two sets for socioeconomic and public health profiles. They deliberately apply only simple standard statistical methods in the public health analyses: t-test, Mann-Whitney test, bivariate regression, and backward stepwise multivariate regression. The book assumes familiarity with basic statistics. 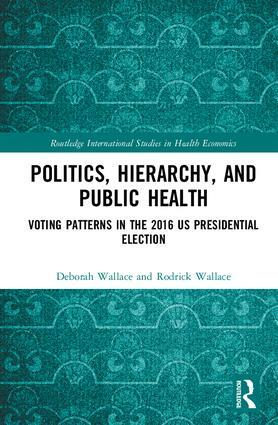 The authors argue that the unequal power relations that result in eroding public health in the nation and, in particular, in the Trump- voting states, largely cascade from the collapse of American industry and they analyse the Cold War roots of that collapse. In two largely independent chapters on economics, they explore both the suppression of countervailing forces such as organized labor and the diversion of technical resources to the military as essential foundations to the population-level suffering that expressed itself in the 2016 Presidential election. This interdisciplinary book has several primary audiences: creators of public policies such as legislators and governmental staff, public health professionals and social epidemiologists, economists, labor union professionals, civil rights advocates, political scientists, historians, and students of these disciplines from public health through the social sciences. Deborah Wallace, an ecologist, pioneered the transfer of ecosystem analytical approaches to social epidemiology and health inequality. A research scientist in epidemiology at the NYS Psychiatric Institute, Rodrick Wallace is well-known for modeling cognitive processes ranging from cellular level immunity up to national economies and to decision-making in large institutions.